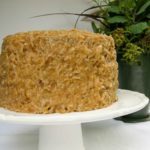 A recipe for a classic German chocolate cake with coconut-pecan frosting. In a small bowl, pour boiling water over chocolate. Stir until chocolate is melted. Set aside to cool. Preheat oven to 350 degrees F. Grease 3 round 8- or 9-inch cake pans. Line bottom of pans with parchment paper. Grease parchment paper. Set pans aside. In a large bowl, beat sugar and butter until light and fluffy using an electric mixer on high speed. Beat in egg yolks, one at a time. Beat in cooled chocolate and vanilla on low speed. Mix in flour alternately with buttermilk, beginning and ending with the flour, until batter is smooth. (Do not over-mix). Fold in egg whites. Divide the batter equally in the pans. Bake until a wooden pick inserted in the center comes out clean. 35 to 40 minutes for 8-inch pans. 30 to 35 minutes for 9-inch pans. Cool cakes in the pans for 10 minutes. Remove cakes from pans and cool completely on racks. In a medium saucepan, add sugar, evaporated milk, butter, egg yolks, and vanilla. Cook over medium heat for 12 minutes or until thickened and golden brown, stirring constantly. Remove from the heat. Stir in coconut and pecans. Cool until of spreading consistency. Spread frosting between layers, on top, and on sides of the cake. You may need more frosting if using 8-inch cake pans. If so, increase quantities to: 2 cups sugar, 2 cups evaporated milk, 1 cup (2 sticks) butter, 7 egg yolks, 2 teaspoons vanilla, 10 ounces coconut, and 2 cups chopped pecans.